Cross Stitch Ornament Kits make it really easy to create beautiful handmade decorations for your own home or to give as Christmas gifts. To make cross stitch ornaments you can either gather the materials and patterns yourself, or you can simply purchase a cross stitch kit. Most cross stitch ornament kits have everything needed to make Christmas tree decorations that will be treasured for decades by family members and friends. Each handmade ornament is constant reminder of you and the time you were willing to spend creating a symbol of your love. There are kits available that come with supplies to make several ornaments, or you can purchase the individual ornament kits separately. There are benefits to either, but the most important thing to remember is that you will be investing time in these projects and you want something that will be fun and practical. After all, it would do you no good to purchase a kit that will make 30 ornaments if you really only have the time and interest to make one ornament. If you want a kit that makes a lot of small ornaments, then you might want to consider this Bucilla kit for tiny stocking. Bucilla has been a long recognized company with an excellent reputation for cross stitch kits. Their kits come with everything you need to create whatever is on the cover photo. In this case, there are sufficient materials to make 30 stocking ornaments. With 30 separate ornaments, you could easily have several Christmas gifts covered by giving a smaller set of 5 or 10 to each recipient. Or, keep some for yourself and gift the rest. This cross stitch ornament kit even includes a floss separator card and a needle. With this kit, you will need to allow time to actually make the stockings in addition to cross stitching. Dimensions is another name you can trust in the crafting world. The finished ornament in this set of “Christmas Sayings” ornaments are a bit larger than the stocking ornaments above. They are approximately 4″ – 4½” each. 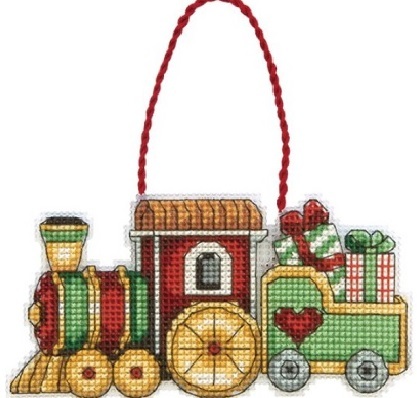 There are supplies and counted cross stitch patterns for 6 ornaments in this kit. You will need to purchase stuffing or batting separately if you want the ornaments to have that plump look shown in the picture, but the felt backing is included. These are really pretty ornaments and could easily be given as 6 separate gifts, or as a set to one very special recipient. For specialty ornaments, or if you want a specific ornament that would have special meaning to you or the recipient, than a single ornament kit may be all you desire. There are definite benefits to the single ornament kits. In addition to getting the exact ornament you want, there aren’t a lot of threads to separate, simply because you only get enough threads for one ornament. You will also feel a sense of accomplishment mach sooner. Anyone can finish one ornament faster than they can complete a dozen. For a beginner, I would always recommend a single ornament kit. Here are some really awesome single ornament cross stitch kits. There are several of these kits that I really love myself. Cross stitch is truly easy enough that just about anyone can master the technique and hand stitch lovely pictures, ornaments, stockings, embellishments and a variety of other fabulous home decorations and gifts. Cross stitch Christmas ornaments are the perfect project for a beginner or a very fast project for an accomplished cross-stitcher. The cross stitch ornament kits just make everything a little easier for all of us.